Achieving Zero Waste seems to be one of those impossible tasks, like not eating all the Pringles in a pack or seeing a week-long juice cleanse through to completion. 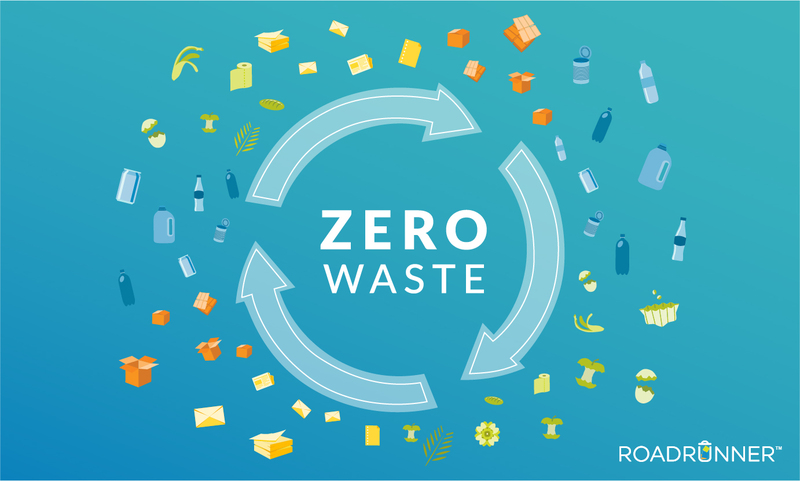 We at RoadRunner recently took a deep dive into the seeming Utopian grandeur of the Zero Waste movement, and found there's a lot more philosophy behind the phrase than its rigid nomenclature would suggest. Read on to learn about how businesses of every size and shape can recycle more, use less and save money, all by implementing a "Zero Waste" program. "Zero Waste" has become something of fashion statement in the press these days. Cities and businesses alike have set ambitious goals for their organizations, including San Francisco and Fort Collins, and NYC's new 0x2030 plan, among others. Global corporations too, have jumped on the "landfill free" bandwagon, with corporations like PepsiCo, Unilever, and Subaru all espousing aiming for Zero Waste at distribution / factories / fulfillment centers in the next few years. WHAT IS THE Zero Waste CONCEPT, anyway? "the concept of Zero Waste goes beyond recycling and composting at the end of a product's life cycle, to encompass the entire life cycle of a product, beginning with product design, and envisioning the use and management of materials in ways that preserve value, minimize environmental impacts, and conserve natural resources." The sustainability benefits of Zero Waste programs are obvious, but what about benefits for business? Financially, these policies prove big winners, and as Eric Lombardi, executive director of Eco-Cycle International says: Waste = Wasted Cash. Indeed, many giant corporations are seeing huge financial victories - Unilever reports its program saved them more than $1.9 million in 2013 alone. Fort Collins, Colorado announced a city-wide goal of 75% diversion by 2020, 90% by 2025, and Zero Waste by 2030. To help reach their goal, one of the city's main focuses is their food waste diversion, as more than half of the materials landfilled by Fort Collins residents and businesses could be composted. Fort Collins launched a campaign in 2017 encouraging communities to Save Your Food, and have inspired local businesses like New Belgium Brewing, who has diverted 99.9% of their waste from landfill, to focus on waste reduction as well. PepsiCo, who announced their goal to make 100% of their packaging recyclable, compostable, or biodegradable by 2020, hopes to achieve Zero Waste to landfill by 2025. PepsiCo was widely recognized in 2018 for helping make Super Bowl LII the first Zero Waste Super Bowl. Their Rush2Recycle campaign, launched prior to the Super Bowl, encouraged fans in the stadium and at home to recycle and reduce their waste on game day. The program recovered 91%, or 63 tons of all the trash created inside and outside of the stadium by recycling, composting, or donating the waste. PepsiCo and the Rush2Recycle team hoped to set a precedent for how other teams, leagues, and fans manage waste in their communities. Subaru became America's first Zero Waste to landfill auto maker, with 99.6% of all their waste being recycled or reused. Over the last 15 years, their program has saved the company over $13 million. You might be wondering how they are able to recover nearly all of their waste and save that much money. “What we do at Subaru is not rocket science," explains Denise Coogan, manager of safety and environmental compliance for Subaru of Indiana Automotive. Subaru creates recovery and reduction plans for every form of waste generated in their plant. They design their products so they can easily be recycled or reused - from packaging materials to bumpers, airbags and steel. They even have two onsite composters to divert their organics from landfill. Subaru's Zero Waste program is impressive to say the least, and many manufacturing companies look at their model as inspiration for their own waste reduction programs. While many businesses balk at the idea of implementing programs on such large scales, even gradually easing into Zero Waste policies can start yielding big results. The following list is our SMB quick list, designed to help your small or medium sized business design a customized Zero Waste program that works for you! Conduct a waste audit of your office, facility, factory, school, restaurant, etc. to identify types and volumes of waste generated in your business. Once you begin to understand the kinds of materials your business disposes of on a regular basis, you can design an advanced recycling program to achieve Zero Waste. Did you know RoadRunner offers complimentary waste and recycling audits? Schedule a free consultation today! Invite multiple stakeholders from all aspects of your business to review common procedures, habits and workflows to identify areas of excess and where you can cut waste. This conversation will help you set goals for your program and develop waste prevention and reduction strategies. The success of your new program really depends on employee, student, guest or faculty participation. Assign an "Eco" or "Green" Ambassador title to a motivated stakeholder, who can act as the locus from which all program changes and motivations emerge. He or she can get creative with engaging fellow office mates, and the collaborative air will go a long way in encouraging sustainable practice in the workplace. Learn how to become your office's Eco-Ambassador here. Is your business planning on implementing a Zero Waste program? Let us know how it goes in the comments below, or reach out to us with any questions. We're always happy to talk trash with you!